Sub: Implementation of “Digital Life Certificate Programme” – regarding enrollment of Defence Civilian and Defence Civilian Pensioner. Ref: This office DO letter No.PT/3088/DLCP/Vol-II dated 30.03.2017 and letters dated 13.06.2016, 18.09.2017, 17.11.2017 & 29.05.2018. Please refer to this office letters cited under reference. 2. 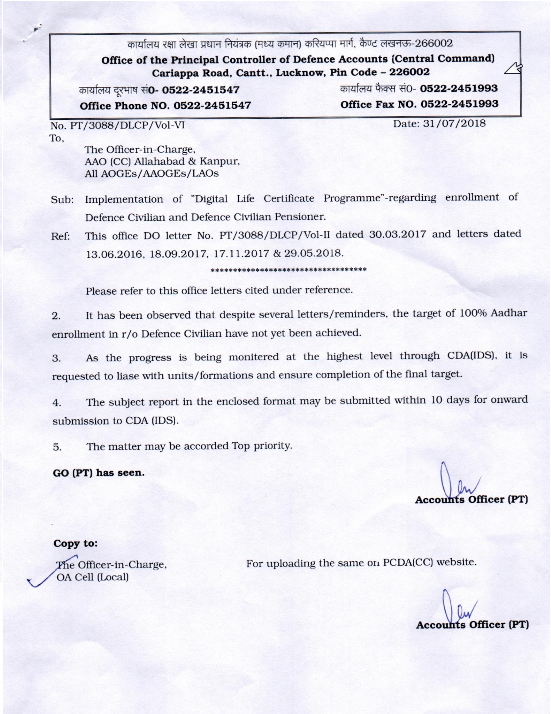 It has been observed that despite several letters/reminders, the target of 100% Aadhar enrollment in r/o Defence civilian have not yet been achieved. 3. As the progress is being monitored at the highest level through CDA(IDS), it is requested to liaise with units/formations and ensure completion of the final target. 4. The subject report in the enclosed format may be submitted within 10 days for onward submission to CDA (IDS). 5. The matter may be accorded Top priority.